Using video to help patients with serious illness make decisions about future care seems like a “no brainer.” Think back to your early training. Remember being at the code for that patient with advanced cancer, wondering why he wasn’t DNR? If he could only have “seen” what it was like to be coded, to be in the ICU, to live on machines. The allure of video is obvious. But as with any thing that seems too good to be true, the reality of using videos to jumpstart goals of care conversations is more laden with potential pitfalls than is apparent on the surface. A bead of sweat ran down my forehead. Had I really just said “Cushing’s triad?” I was hiding behind medical jargon. What I really needed to say to Helen was that no matter what anyone might do, she would die very soon. Angelo later takes Helen on a tour of the ICU. In the midst of the tour Angelo is called into a code blue for an ICU patient. The code is witnessed by Helen and her husband. Disturbed by what she sees, Helen decide to shift to focus on comfort care. Helen is discharged with hospice and dies at home, surrounded by family and her students. This is the ah-ha moment. To reach more patients, Angelo unites his passion for improving goals of care conversations with his boyhood dream of becoming a film-maker. He starts to use video in the care of patients with serious illness to dramatic effect. He creates video examples of what it would be like to chose life prolonging care, limited medical care, or comfort care. Angelo starts to study the use of video. After viewing the video, patients are more informed, would recommend use of the video to others, and are more likely to chose a comfort oriented approach when compared to a scripted conversation. Now, I happen to know Angelo well. We were in fellowship at the same time - he in bioethics, me in palliative care – and we did our research training together. I know that the story is more complicated and the journey toward video rockier than depicted in the book. I remember a research class where Angelo showed a video of a woman with Advanced Dementia. In the video she is lovingly cared for by her family. The voice-over describes the clinical course of advanced dementia. Our course instructor for this session, a Geriatrician, asked the class, “did anyone notice anything unusual about the woman in the video?” We didn’t. “Her mouth was open and her tongue was hanging out of her mouth. Many people with advanced dementia don’t have that appearance. Might the image of the tongue lolling out of the open mouth sway the viewing audience toward a decision that living in such a state is undignified?” We acknowledged that it might. Angelo has put a tremendous amount of thought and work into addressing concerns such as these. The primary concern with the use of video is that it the video will be biased biased toward a comfort-oriented approach. In response to these concerns, Angelo has removed testimonials from his videos, and decided to depict CPR on a dummy rather than on a live (or dying) person. We need this sort of hard work and attention, because Angelo is right: video is a remarkably powerful tool. As one of his patients says, “if a picture is worth a thousand words, a video is worth hundreds of thousands.” Angelo likens his videos to the Kahn academy’s inversion of the schoolroom – empowering students with knowledge and leaving class time for discussions with teachers. And similarly, patients can be “activated” by videos to engage their physicians in thoughtful conversations about goals of care. He is careful to note that videos should supplement, not replace, conversations with healthcare providers. This is a very important book. It presents a remarkably compelling case for the use of video in advance care planning. To be sure, the book is not without flaws. At times Angelo seems to want to teach a lay audience the intricacies of medicine, when a simpler explanation will do. The citations, including journal names within the text, will likely be distracting for a lay audience. These are the challenges of someone who is used to writing meticulously cited journal articles learning to write a book for public consumption. Overall however, we should be grateful for Angelo’s hard work in this area. 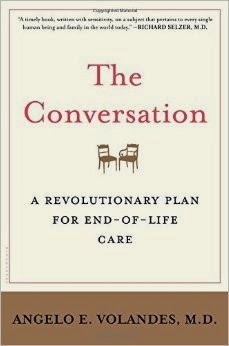 Video, used correctly, does have the power to “revolutionize” end-of-life care, as the subtitle of the book suggests. It needs to be done thoughtfully, and with great care, an appropriately high bar for someone crafting a goals of care video for thousands, perhaps tens of thousands, perhaps millions of people. Thank you for your review of The Conversation. It's rare to be reminded of the value of diligence; the value of working hard to provide the best information without using it as an opportunity to proselytize for a personal agenda. I counsel elders and their families all day, five days a week. 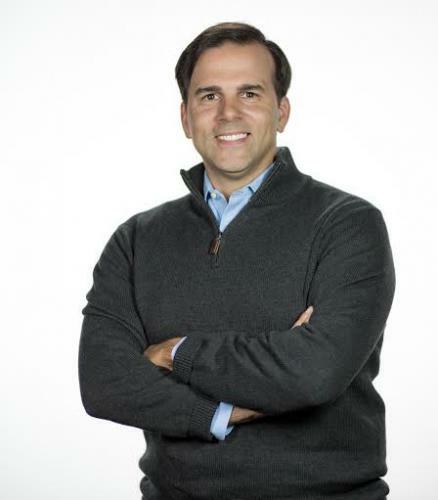 Dr. Volandes is a model for the thoughtfulness that is ideally associated with what aspires to be a healing profession. I am lifelong volunteer EMT who now has an "invariably fatal cancer" and from that bit of information I imagine you can accurately predict my advanced care preferences - having already done more than my share of rib cracking. I have ordered Dr Volandes' book and look forward to receiving it. I want to encourage providers to focus not only on the negative aspects of futile, painful, invasive EOL interventions, but to also develop effective video showing the positive side of opting for palliative medicine. I do not plan to die vomiting from chemotherapy in my veins. Instead, I am emotionally and spiritually flourishing with the freedom and intensity of the heightened sense of life as I approach it's end. I've had time to contemplate what is most important to me and am completing my priorities. I speak with the straightforwardness of someone who has no time to waste, nothing to gain or lose, and will make certain everyone I love knows it. I requested a palliative care consult as soon as the study came out reporting that lung cancer patients lived longer and with better quality of life with earlier PC treatment, and improved symptom control has allowed me to enjoy my remaining time much more, and be much more productive, given my physical limitations. My quality of life is much more satisfying than I had any reason to expect from my prognosis, and my loved ones are benefitting enormously from my ability to be emotionally present and spiritually at peace. I have hope their grief will be uncomplicated, shortened, and untroubled by regret, a reassurance that allows me to depart with more inner peace. Please consider bringing patients into this process of advancing responsible medical care at the end of life. We have responsibilities and much to offer.